Deodorising Foot Cream refreshes the feet and supports healthy skin. Natural silk powder and rice starch directly absorb excess moisture for long-lasting comfort. This formulation protectively envelops the foot with a fine layer of powder, helping prevent friction and pressure points. The composition with rosemary essential oil, sage and real European goldenrod helps tame excess perspiration. This helps create a balanced environment for the feet, helping to prevent unpleasant odors. Regularly apply a thin layer of Deodorising Foot Cream to the sole of the foot and between the toes without massaging it in. Smooth on a little, lovely scent lasting all day..and all night! Silk Body Powder cares for feet experiencing excessive perspiration. Hydrating Foot Cream moisturises and soothes dry, rough feet, and can be used for massage. Tired legs will welcome the refreshing, energising benefits of Revitalising Leg & Arm Tonic. Relax and enliven legs and feet by soaking feet in Sage Purifying Bath Essence. Next, bring ease and comfort to the legs by massaging Revitalising Leg & Arm Tonic in an upward motion towards the heart. Finally, massage feet with Deodorising Foot Cream for soothing foot care. 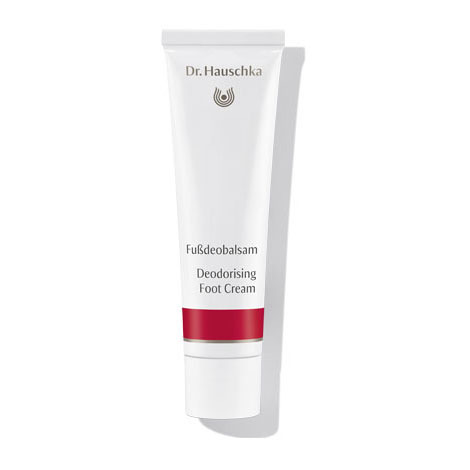 Treat yourself to a Dr.Hauschka Foot Treatment from a Dr.Hauschka esthetician.